In order to maximise our time and perform our 'ibaadat with ease, we should try to follow a set routine or timetable. 2. The ideal way to perform tahajjud with suhoor is to wake up early and perform tahajjud and make du'a before suhoor. Everyone in the house should wake up and engage in 'ibaadat in the darkness and isolation of their own rooms. Shed tears and ask Allah ta'ala for your needs just as a small child cries and gets his needs fulfilled. Rasoolullah (Sallallaahu Alayhi Wasallam) has encouraged his followers to cry when making du'a. Crying and weeping attracts mercy. Just as a mother who, upon seeing her child crying for a sweet, will succumb at the sight of the child's crying and treat it with mercy, similarly when one sheds tears whilst beseeching his Lord, the Mercy of the Lord will enshroud him. 4. After Fajr remain engaged in 'Ibadat till 15-20 minutes after sunrise and perform 4 rak'at ishraq. 6. Perform Zuhr with congregation. If possible, engage in 'Ibaadat for a while and have a short rest with the intention of qayloolah - a Sunnah of our beloved Nabee (Sallallaahu Alayhi Wasallam). When Allah has made a promise through His Nabee sallallahu alayhi wasallam there is no doubt in the acceptance of these supplications. In spite of this, we find some people whose prayers are not answered. This does not mean that their prayers have been rejected. It is Allah's, favour upon us that should He find that granting us what we ask from Him is in our interest, He grants, otherwise not. Another point to remember is that there are certain conditions in the absence of which they may be rejected. Among these is Halaal food and making Du'a with attention and concentration. If our hearts and minds are not in our Du'a, then they may not be answered. My friends, we must make the habit of bringing a few dates with us at the time of Asr and after Asr we must engage in zikr, tilawat, tasbeeh, etc. until just 15-20 minutes before Maghrib when we should raise our hands in Du'a until Adhaan. In this way, everyone will be engrossed in their own 'ibaadat and we will find that if some of the individuals are crying others will also get the inclination to do the same. Therefore value this time between Asr and Maghrib and do not waste it in worrying about food. The saintly people are such that not even if gold and silver, never mind food, will distract them. Their concentration in their Du'a is not affected; whereas, we would not even be able to concentrate if only a small morsel was to be put in front of us. I would request my sisters not to spend the time between Asr and Maghrib in the kitchen. 8. After performing Maghrib, we should perform 6 Rak'at of awwabeen after the two Rak'at sunnat and two rak'at nafl of Maghrib. However, those who do not feel inclined to do this, some Ulama have said that two rak'at sunnat and two rak'at nafl of Maghrib can also become part of the 6 rak'at awwabeen. Hence, performing only two rak'at after the sunnat and nafl of Maghrib will suffice. 9. 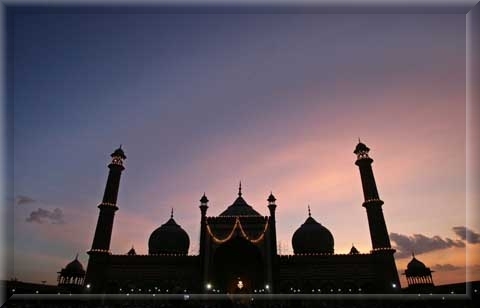 During the winter months in Britain there is a lot of time between Maghrib and 'Isha. After food, we should sit the household together and read from Virtues of Ramadan by Shaykhul Hadeeth Maulana Muhammad Zakariyya for at least 15 minutes, followed by tilawat, with all the members of the family joining in. This will create a good atmosphere and environment in our homes and at the same time Ramadan will pass joyfully with an abundance of Barakah in the home, insha' Allah. 10. Thereafter return to the masjid and engage yourself in 'ibadat. Take great care not to get involved in any worldly talk. It is very upsetting and disheartening to see people wasting their time in futile talk in the masjid even during the month of Ramadan. Try and restrain yourself and remain engaged in 'Ibadat until 'Isha. The sisters should note that 20 rak'at taraweeh is sunnat-e-mu'akkadah for them too. They must perform taraweeh after 'Isha. 11. After taraweeh, go straight home. Do not loiter around outside the masjid wasting time. At home, remain in 'ibaadat until you go to sleep. Sleep with the intention of waking up for tahajjud and suhoor. 12. Apart from the above, we know that in Ramadan. there are always, various programmes taking place in the Musjid led by our Ulama. These are for our own benefit. There are many of us who are very sinful and during this month, our hearts are softened and more receptive; by listening to the wise words of our Ulama the chances of bringing good deeds into practice are greater. Although the month of Ramadan is solely for 'Ibaadat, we should try and attend these programmes in the Masjid because by listening to these discourses, Insha'allah, changes will come into our lives for the better. Our hearts are blackened by and full of sins and by listening to these programmes and sitting in the company of the Ulama and the pious, change will definitely occur in our hearts, insha'allah. Allah's Mercy is in abundance throughout the year, especially during this month. We should yearn in our hearts for this Mercy because we need mercy, blessing and forgiveness from Allah. We are sinful and in this month we want to win Allah's Attention so that we can become His Beloved Slaves. If we are eager to perform good deeds then, insha'allah this month will become a month of great blessing for us. NOTE: Everyone should try to take rest in order to conserve energy for the compulsory ibaadat. There is no point in remaining in nafl 'ibaadat and not getting rest, which will result in tiredness and laziness at the time of compulsory Salaat, etc. Hence, every person should fix a convenient time for rest and include it in the timetable set out above. May Allah accept our efforts and make every moment of this month a means of receiving His Mercy, Blessing and Forgiveness. May we all be granted a place in Jannah, Ameen.